Here we are in Hoedspruit, South Africa! Three days ago was my birthday, so we drove to my favorite restaurant (so far) in South Africa. There they serve “pancakes” (crepes), and I got cinnamon sugar, which I used to get at the Magnolia Farmers Market. In the yard of the restaurant, there were tons and tons of goats and also a huge baobab tree. These trees aren’t very tall, just the height of an oak tree, but they have extremely thick trunks. The trees can live to a very high age and have big and edible fruits. After breakfast, we drove down a really long and bumpy dirt road at about 5 mph. Eventually, we got to the site of Jessica the hippo! Jessica is a friendly, but still a wild hippo that is cared for by a couple that raised Jessica, after she was washed away from home in a flood. The hippo is free to go anywhere she likes, but lots of the time, she’s in the river by the place we were at. We walked onto a wooden platform that was floating on the river, where a massive hippo head was resting. One of the property owners (Tony) had a bucket of corn and other veggies that he was feeding Jessica. He talked about finding her for a bit, and then grabbed my wrist and brought me right up to Jessica. Now you have to understand that hippos kill more humans than any other animal in all of Africa. They can open their jaws 180˚, and have four almost foot long tusks that they use to bite off peoples heads, but they don’t even eat any type of meat! They are extremely territorial, so just never go near one if you know what’s good for you. We also watched a DVD of a news show on Jessica (she’s been filmed more than any other animal – according to Tony), that we were supposed to watch before meeting her, but oh well. We also were licked in the hair over and over while watching the video by a pit-bull (which I didn’t mind because she was friendly) that was owned by Tony and his wife. The poor dog had lost 12 siblings to crocodiles in the river. We weren’t in danger though, because Jessica is quite protective of humans and chases crocs away. 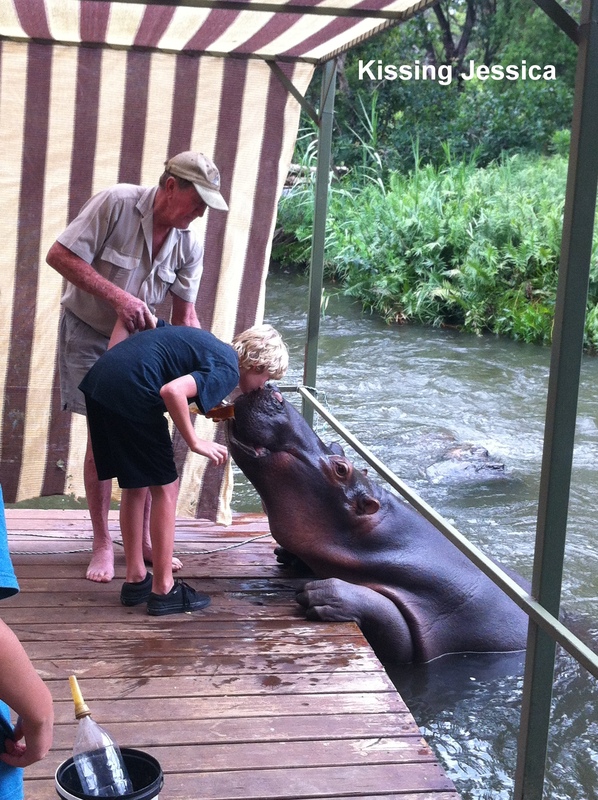 At the same place, we got to pet a very cute baby hippo that was found in a very recent flood that wrecked Tony’s home. The place where we parked our car was covered in 6 feet of water and we saw debris from the flood in a tree high over our heads. After that experience, we drove to some mountains that I had seen from the restaurant that we had breakfast at. They were covered with very green trees and had numerous red and yellow cliffs and even a waterfall. The place was beautiful. 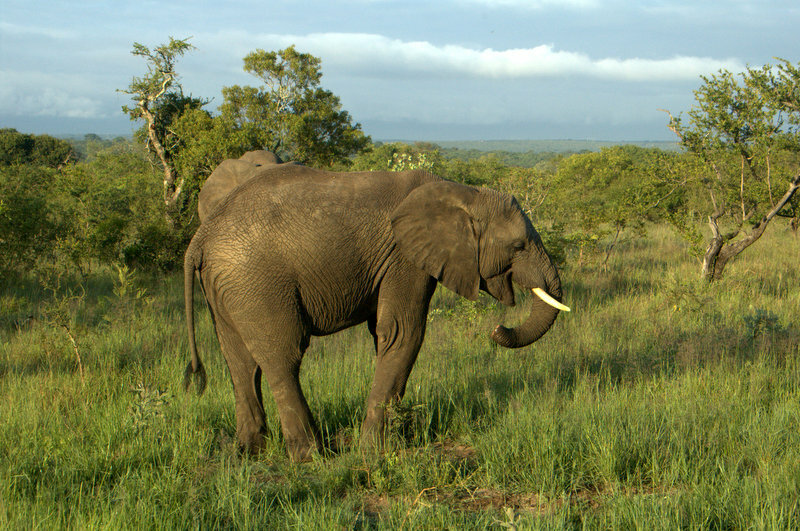 I like South Africa a lot because you don’t need a tour guide to see things. You see things like the mountains, wild zebra herds, giraffes, buffalo, wildebeest, warthog, and many more just driving down the road! 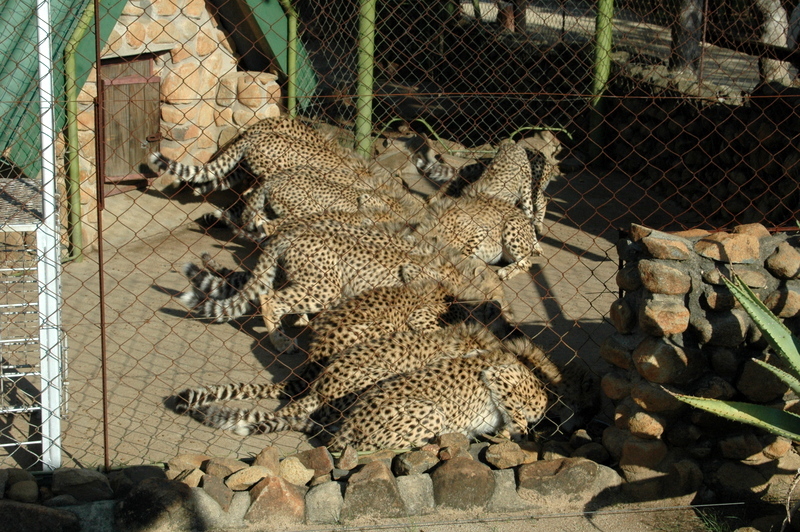 This time we were going to see the HESCs’ cheetahs, which the Center is breeding and trying to keep in existence. We got in a safari truck and drove around a bunch of large enclosures that had (wild) wild dogs (they had broken in to the enclosures numerous times – now its their chosen home), tame lions that were rescued from a bankrupt circus, some other cats like serval, large birds, and then cheetahs. Cheetahs are the coolest animals. They are very slender, because they have to be able to run very fast (up to 60 mph). Their bones are hollow, to make them lighter. 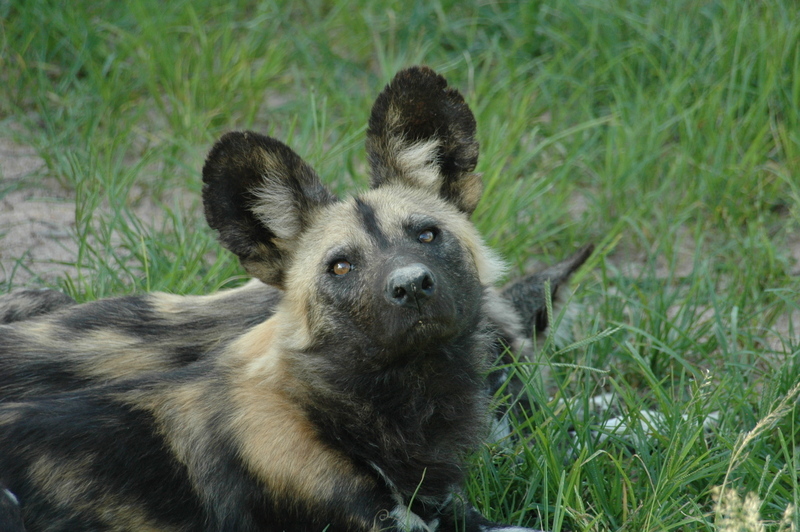 Their fur is sleek and shiny, and they have long, black tear stripes down their face. The difference between a cheetah and a leopard is that the cheetah spots are solid black and the leopards have no tear stripes and their spots are brown with a black bordering ring. The Center has female and male cheetahs; they have to be separated because the females get tired of the males and attack if they’re in an enclosure together. We even saw baby cheetahs, which were very fluffy and adorable. I asked if we could see them eat, because we saw a truck with meat coming. Our guide said yes (!). This was one of the most amazing things I’ve seen on our entire trip. It’s kind of hard to explain…The workers put a bunch of trays of meat (one for each cat) out in a row in a closed off part of the cage, then let the babies into that section. They all fought and ran and crowded around the beef, and ate it all up quickly. One guy had to stay in with them, which I would never do because even the little cheetahs were quite ferocious. And that ended our amazing adventures (for now)! Thanks for reading!! !